Sending out wedding invitations is a formal way of the bride and groom announcing to their friends and family they intend to marry. Wedding invitations can also be used to reflect whether the wedding is to take on a traditional or a contemporary feel. Start by deciding what stationery you require. Most couples purchase wedding and evening invitations, reply cards, order of service/ceremony, table plans, place cards, and thank you cards. Look in the high street stationery shops as you could find what your really looking for straight away. If unsuccessful look on the internet for companies which offer a large selection of images from which you can choose from and offer to send you FREE samples. 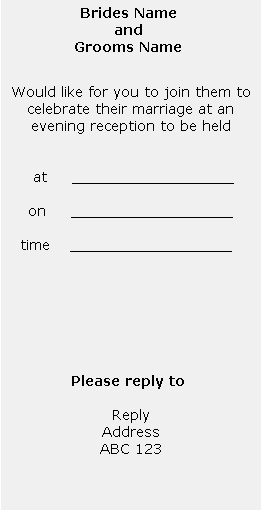 Once you've chosen your wedding stationery it's important to get the wording right. The company you purchase the invitations from will often supply you with several options to choose from. The main difference will be whether the invitations are being sent from the parents or the bride and groom themselves. 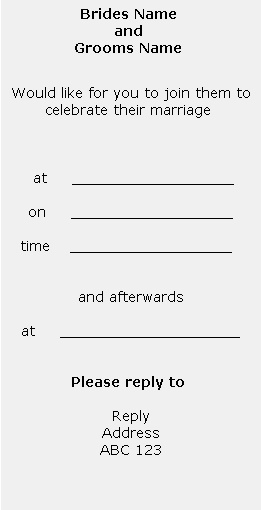 Here are four examples given below of how you might like to word your invitations. Find a suitable off the shelf set of wedding invitations and stationery from the high street. There are a wide range of traditional and contemporary styles to choose from and you no doubt will find one you like. There are a whole host of companies out there offering to create personalised invitations and wedding stationery. But remember quite often with a personal service the cost becomes more expensive, so be clear on exactly what you want and its cost before you commit yourself to any order.